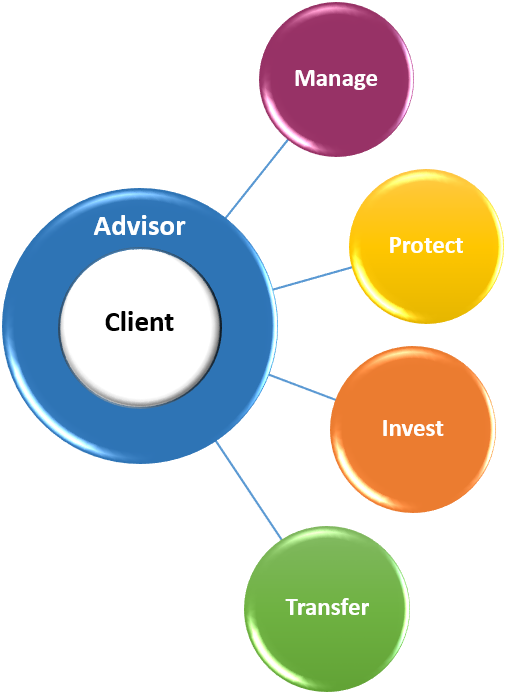 The comprehensive financial planning services we provide are built around our 4 Wealth Points. These 4 Wealth Points represent the areas we have found to be most important to our clients and their families. By systematically addressing each of these 4 Wealth Points, we are able to help our clients plan for, and pursue, the goals they would like to achieve in their lives. In this area we want to assess and provide advice on how you are managing the resources available to you and if they are in line with what you value most. This will involve evaluating how you are utilizing your income, managing debt, utilizing employee benefits, optimizing your taxes and assessing future income sources. In this area we want to assess potential risks to your financial plan. This will involve evaluating the impact of events such as a premature death, a disability, loss to your property and health events. Once those risks are evaluated we will work with you on how best to mitigate the financial impact of these events. In this area we want to assess and provide recommendations on the allocation of your investments. This will involve evaluating the needs of your plan, your tolerance for risk, the time horizon of your plan and the investment options available to you. In this area we want to assess the legacy you would like to leave. The term “legacy” means something different to everyone. For some that may be providing funds to a charitable organization. For others, it may be providing for family members. Once your wishes have been identified, we will need to evaluate such things as your estate documents, estate tax implications, charitable giving options and family dynamics that may come into play.